SKET Dance is pretty good. I definitely wouldn’t put it as my favourite or a masterpiece but it’s definitely worth a watch. The characters are endearing, the one-shot plots are comedic and fun for the most part, and the animation is really good and expressive. However, it ends WAY too suddenly. It introduces new characters 5 episodes before ending. The backstories behind the characters are quite jarring compared to the normal episodes, especially Switch’s. SPOILERS AHEAD. Switch’s backstory is too extreme. I feel like it would’ve made more sense if his brother was envious of him and Switch said something like “ha you’ll never be as great as me” causing him to try to commit suicide and ends up in a coma instead of getting KILLED BY A CRAZY PSYCHOTIC JEALOUS GIRL! Then it would make sense for switch to stop talking because what he said made his brother go into a coma. Anyway, by the second half of the series it isn’t often you see the “abilities” of the main characters that used to be in every other episode so it’s a bit disappointing. Overall SKET Dance is a great series, I really recommend it. However, it does have quite a few shortcomings and because of them I stick with my opinion of this series a solid 4.0/4.25 instead of a 5.0. This is the kind of anime which you would watch every seconds of each episodes, because the story often does not follow the common storyline. It always leaves you struck with different emotions, as you fall in love with the characters in the story. Each characters builds and balances the story perfectly, this way the writer could purposely hide and give hints within the storyline only to leave the viewers in shock. All in all this a wonder full anime, that I would probably re-watch! My very first review was saved for the perfect show. I am not one to review show, but SKET Dance is the exception. I'm going to be honest here, I originally started watching the show for the soul fact that episode 21 title was Otaku & Occult. If that was was enough to make me laugh, I was in for a tough time. This show made me hugging my sides from laughter, cry ( and I don't cry often when it comes to shows), and left me with a satisfied feeling at the end of each episode. Also if you are like me and play anime openings and closings, this show's openings should end up on your playlist. I HIGHLY recommend this show! First off, this anime is hilarious. There are some episodes that are misses but they are few and far between. When you're not laughing over what mess the trio has created/ is trying to solve you're being sucked into their backstories that are definitely no laughing matter. Switch has to be one of my favorite characters of all time, even in the episodes where he only has a few lines those few somehow add to make the episode even better. After seeing a few gag mangas be adapted into fast-paced-no-time-to-even-breath animes, I braced myself for Sket Dance. I was pleasantly surprised to find that not only was the pacing really good, but so was the voice acting as well as the animation. There are a few parts where the drawing are a little sloppy but it didn't take away from the story at all. If you like animes with great comedy as well as amazing character development I would really recommend you watch this anime. Where do I start with this amazing anime 0_0! Now I've never reviewed anything like this before in my life, but I've come to love this anime a whole lot! Now I've seen 1000s of anime. And I never once thought of review a single 1 but this anime has changed my mind. Why cause I like it so much. I believe all anime should be given a 25 episode chance before you truly judge an anime. So give it a chance! First Review. Best way to start. Honestly, I didn't know what to think when I first started watching this show. It seemed like it was trying to find it's footing, between comedy and drama. But, In the end, It worked out. It had some great characters, story arcs, and I loved the episodic format. The show knew when to take its self seriously, and managed to turn out a great, albeit relatively unknown, series. Great job. Is an understatement. It is frankly similar to gintama, the fact that hideaki sorachi assistant made it is relevant, similar art styles,and similar plot lines with 3 main characters group, following one leader ,humorous situations,Most of the same seiyuu's (voice actors)etc. Now it is not fair for me to say I was expecting the same as Gintama. Honestly I wasn't really. I just wanted to watch something fun and with good art style to pass the time. But watching the first episodes I found it annoying. The characters felt like bad copies of gintama, strong short tempered girl, witty yet weird boss and glasses guy(sorry shinpachi XD thats all you are) with weird computer for voice for some reason...it was like all over the place. I mean I love the animation,colors and style but felt bored with the kinda forced humor, the main character just annoyed me for some reason, I get he is a immature kid but..ugh I can't explain it really. But well to be short it gets the feeling of a bad copy of the gintama anime really, a lot of the basic character traits ,plots and what not or the other but falling short. A lot of people seem to like it, to which I say to each his own. But I stopped halfway for these and various reasons. It is nice to watch, animation wise. But the humor felt short to me and the characters boring or annoying really. Btw, even the crossover episode felt boring but was funnier int he gintama anime >_>. So I give 2 stars, one for effort and the other for smooth animation and voice acting. This anime is laugh out loud hilarious with genuine characters and great backstories for each. I love everything about it, and the Gintama crossovers...don't even get me started. This series wormed into my heart, and I really hate that the ending was such a cliff-hanger. Would have kept watching this one forever just like Gintama! 5 stars! The show is a comedy treasure box waiting to be opened, full of a lot of unique characters which can appeal to vast audiences. The situations and characters are very subjective though, I found myself enjoying certain episodes more than others simply on the basis of what characters were featured and even some characters which I simply wish had been written out after the first appearance. While the show does have a large cast of characters, I felt the story around the main characters never really progressed because of it. You eventually learn about the individual pasts of most (if not all) characters in the show, and you do see a lot of present tense nonsense, put basically the back story is explained and then you're back to more nonsense - - not to say the nonsense isn't funny, or that there aren't a few plot developments and twists. SPOILER ahead, it's why I gave the show 4/5 though, so read at your own risk. Between Bossun and Himeko, the writers teased at a love story but never brought it anywhere near fruition, it was always just a tease. This in and of itself is why the show lost a star for me. It seemed like they were teasing for about half of the show, which is why it was so infuriating. However this is really one of my very few complaints about the show. Bottom line is that the show kept drawing me in because of the laughs, but after 20 episodes, if you can't guess the plot developments then I would be surprised. Worth a watch, entertaining and funny to boot, but don't take it too seriously or it will be disappointing. 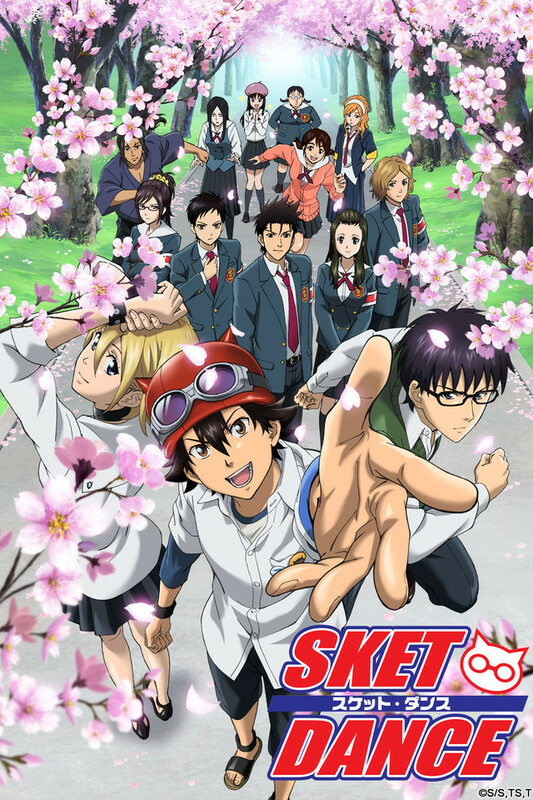 Sket Dance is a series that is impossible to love early and impossible to leave late. This was the first High School Life anime that I chose to watch after whetting my appetite on a few short 12/13 episode series. At first I was unimpressed but the more I watched it the more involved I became with the characters. And in the end, I was severely disappointing they ended it, this series could have gone strong for years and years.